• Plant and animal life: The biological components of any water feature are arguably the most important part. From beautiful floral displays to live koi fish, our team will ensure that your new pond can healthily sustain these organisms, in a way that enhances the beauty of your outdoor space. • Lighting: Fountains and backyard streams look unbelievably more beautiful at night. The sound of rushing water with the glow of waterproof lights will leave your backyard stream one of the neighborhoods most beautiful outdoor spaces, even in the dark. • Durability: Of course, our technicians prioritize low-maintenance ownership. Garden streams, koi ponds, and fountains should be simple to maintain, so we take a high-quality installation pledge. We add only industry-supported parts, filters, and equipment that will ensure headache-free pond maintenance. • Budget: Universal Aquatics is your partner in outdoor home improvement, all for a low price. Our team will work hand-in-hand with you to create a custom design that will fit your budget and exceed your expectations. Water features come in all shapes and sizes. While koi ponds have always been popular in the Atlanta area, other backyard water fixtures like pondless waterfalls are becoming even more popular. Our experts can help you figure out what design will be the best fit for your property. 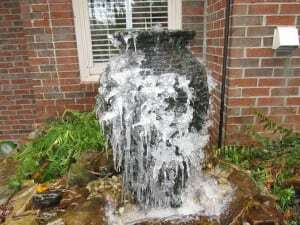 For homeowners, our most popular designs include: koi ponds, backyard waterfalls, garden streams and backyard streams, custom fountains, pondless waterfalls, bubbling rock fountains, vase fountains, and retaining wall waterfalls. For commercial clients like neighborhoods or golf courses, we also design larger projects, including: custom fountains with illuminated displays, golf course water hazards, retention ponds, subdivision entrances, and other commercial design projects. Get Started With Universal Aquatics Ready for a backyard makeover? Adding an outdoor oasis to your Dunwoody home is just a call away. Call the team at Universal Aquatics to chat with one of our pond experts about our custom design services and maintenance programs.